So my nerdy obsession with Madam Secretary continues to go strong as the show continues to push the boundaries of the sort of political and personal stories they can tell. And more and more it feels like the writers are making clever use of actual world events to add more familiar flavors to the show. And it's this last bit that does prove to be rather fun - like a lever celebrity cameo (and the show indulges in this area as well from time to time). It has also expanded to continue a parallel story track that's straight up espionage and anti-terrorism in focus. It's still mostly think tank style of work and not necessarily the sort of high action and drama sequences like you'd see on shows like Homeland or even Designated Survivor. But it's still pretty fulfilling. And this season certainly puts effort into raising the stakes even higher and finding new avenues to explore with these compelling characters. Synopsis: Madam Secretary is an American political drama series created by Barbara Hall with Lori McCreary and Morgan Freeman among the executive producers. As of the time of this blog post, the show is in its fourth season. 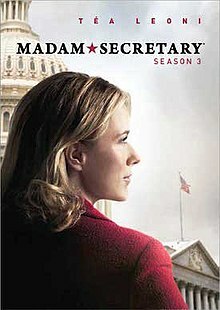 The meta-plot item looming over most of this season is US President Dalton's (Keith Carradine) up-coming re-election bid and a lot of Elizabeth McCord's (Téa Leoni) dealings on the global stage and more and more twisted to some extent by the need to ensure that Dalton is re-elected if Chief of Staff Russell Jackson (Željko Ivanek) has his way. Thus Elizabeth has to do best to wrangle both her allies and her enemies within and without the White House. In the last season Stevie (Wallis Currie-Wood) and Jareth (Christopher O'Shea) had gotten engaged and a better part of this season tries to explore their relationship as they prepare to tie the knot. Around the same time we have Dr. Henry McCord (Tim Daly) stepping back into active service in a way supporting the nation's intelligence operations. And in a seemingly minor plot point, Jason's (Evan Roe) computer gets hacked and the kids are being stalked but of course it has the potential to be part of something much larger. What I Liked: The show has a good number of interesting parallels to real life apart from the obvious way any run-up to an election in a political drama can feel very real. Instead we had some quirky efforts to echo real-life drama such as how "South China Sea" dealt specifically with China's increased activities in the South China Sea and their efforts to assert sovereignty over those contested waters. But naturally we have to cite "Break in Diplomacy" that had Elizabeth punching the new unconventional president of the Philippines after he hits on her in a most in appropriate manner. Real life must make work a little easier for the writers. But the centerpiece of this season remains to be the election campaign. It starts as an annoyance that inlucludes Russel trying to get Elizabeth to meet with backers and attend events specifically to help drum up support for Dalton. But then come the actual election period things seriously pivot and the end result is one of the last things I had expected to happen. I don't want to spoil the political maneuvering that takes place. What Could Have Been Better: The sort of B-story that defines Henry's adventures in counter-terrorism efforts was oddly uneven. The season 2 stuff where he was consulting and acting as a resource was more interesting for some reason. Here the plot starts a little slow as they figure out what they want to do (both in-story and I suspect with the writers) but eventually they start to come up with relatively actionable intelligence. I also felt the cyber-terrorism story arc that had really begun in the last season didn't quite pan out as well as I had hoped. I thought the season opener involving Jason's computer being compromised was potentially interesting and exciting even as it could go just about anywhere. But then the resolution, while logical, just didn't quite push things as far and naturally the election arc had to take over. TL;DR: Madam Secretary remains a very strong show in its third season and more and more the writers are sort of winking at the audience by touching on current events and re-packaging them as episode stories. And how Elizabeth deals with the global arena while making a serious push to support the Dalton campaign. Thus the season gets 4.5 surprise political maneuvers out of a possible 5.